The leading worldwide association for information technology professionals is calling on Secretary of State Mike Pompeo to speak out on behalf of one of their board members, who is imprisoned in Iran, during the United Nations General Assembly meeting in New York this week. The World Information Technology and Services Alliance (WITSA), a consortium of IT industry associations from 83 countries around the world, wrote a letter to Pompeo last week imploring him to personally intervene to secure the release of Nizar Zakka, a U.S. permanent resident and Lebanese citizen imprisoned in Iran since September 2015. "WITSA kindly requests that you intervene personally with the Iranian leadership to obtain Nizar's freedom, both as a humanitarian and moral issue," the group wrote Pompeo in a letter dated Sept. 20. "We also encourage your administration to condemn the imprisonment of Mr. Zakka and other U.S. citizens and permanent residents in the strongest possible terms at the upcoming U.N. Security Council and General Assembly meetings." 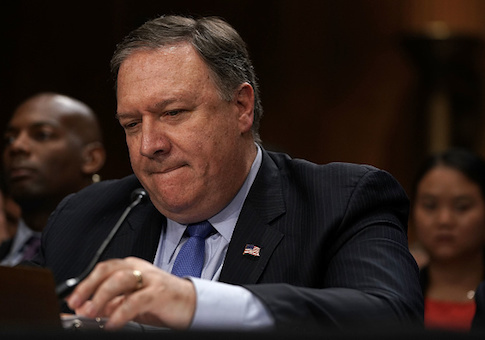 The group's president also recalled how Pompeo, while a House member, made a statement in October 2016 on the House floor supporting Zakka. "Thank you, Mr. Secretary," the group wrote. "We would greatly appreciate your ongoing assistance in this important matter and welcome any feedback from your office." A State Department spokesperson said that the administration continues "to be deeply concerned by reports about Nizar Zakka, who is reportedly a Lebanese citizen who has been unjustly held in Iran since September 2015. We continue to believe he should be released from custody as soon as possible and allowed to leave Iran." The spokesperson did not respond to a question about whether Pompeo planned to press for the safe return of Zakka, or other American prisoners, including Princeton graduate student Xiyue Wang and Baquer Namazi and his son, Siamak Namazi, during the United Nations meetings this week. President Trump late last week said he would chair a United Nations Security Council meeting on Iran during the U.N. summit. The White House has not made clear whether the Trump will in fact focus specifically on Iran's malign activities and violations of international law or more generally on weapons of mass destruction. If Trump zeroes in solely on Tehran’s malign activities, it could trigger a U.N. rule that would give Iran's president, Hassan Rouhani, a chance to respond. There are currently 15 prisoners with western ties being unjustly held in Iran, according to Amnesty International. Many of those prisoners have dual citizenship, or like Zakka have green cards allowing them to live long-term in the U.S. or another western country. Zakka and his family had lived in Washington, D.C., for decades before his fall 2015 capture after delivering a presentation at a conference in Iran. He had attended the conference at the invitation of an Iranian official, Shahindokht Molaverdi, who was then serving as Rouhani's vice president of women’s affairs. Molaverdi, who is now serving as an adviser to Rouhani on human rights, recently spoke out against Iran's treatment of Zakka, telling the Associated Press that Iran had made mistakes in his case. She became the first government official to distance herself from Zakka's imprisonment. Her statements of public dissent against parts of the regime demonstrated a rare crack in government unity and encouraged advocates for Zakka's and other American prisoners' safe return. The group also said it was encouraged by several congressional actions aimed at punishing Zakka's captors, including January House passage of the Iran Human Rights and Hostage-Taking Accountability Act. "WITSA is very concerned about Mr. Zakka's personal safety, his family and well-being," the group wrote. "It is very important that this matter be resolved as quickly as possible." Over the weekend, 1,500 leaders of Iranian-American communities in the U.S. convened in New York to press for more international accountability for Iran’s human rights violations and terrorist activities. The leaders participated in an Iran Uprising Summit, along with former New York Mayor Rudy Giuliani, Gen. James Jones, the former national security adviser and supreme-allied commander-Europe, and former Attorney General Michael Mukasey. Maryam Rajavi, the president-elect of the National Council of Resistance of Iran, delivered a video address to the summit calling on the U.N. Security Council to adopt binding, punitive measure aimed at stopping Iran's human-rights violations.